At Mandibles Catering, based on the Isle of Wight, we provide outside catering for every occasion, from private dinner parties, weddings and funerals to meetings and conferences. All functions are catered for as our menus are specifically designed and tailored to meet each customer’s requirements and financial budget – whatever the occasion we can help to make your event extra special. Established in 1982, we at Mandibles pride ourselves on our ability to deliver top quality food at the right price with professional customer service. We use, wherever possible, organic, fresh and locally sourced ingredients to ensure that our dishes are served to the very highest standard. This includes home grown fruit, vegetables and herbs from our own grounds, as well as our own free range eggs. Please feel free to take a look at our menus or call or contact us to talk through your requirements. 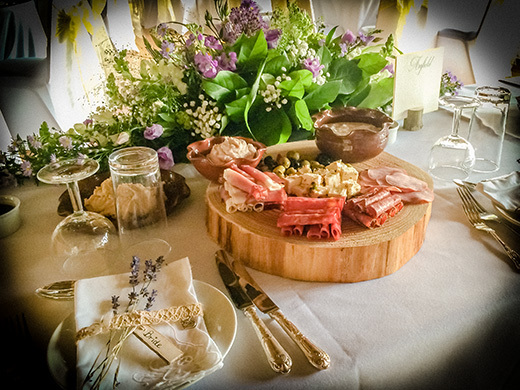 Or, if you’d like to know more about Mandibles Catering, click here! Dear Amanda, Just a quick note to thank you for the finger buffet at Cowes Golf Club on Saturday. There were several compliments passed to us about the quality of the food & it helped to make the party a great success. I was also very impressed with your prompt & reliable service. Thanks again & kind regards.